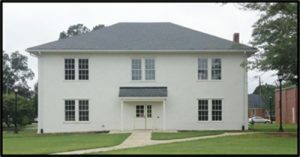 The Winterville Heritage Foundation, in partnership with the City of Winterville, has been instrumental in the restoration and renovation of the Winterville Auditorium and the Winterville High School which now houses the Winterville Center for Community and Culture. Between May 4, 2010 and January 31, 2011, the City of Winterville approved the expenditure of $117,369 in general funds for roof and other repairs for the Winterville Auditorium. In October 2010, the City of Winterville received a Community Development Block Grant from the Georgia Department of Community Affairs in the amount of $500,000. Coupled with a $750,000 USDA loan to the City of Winterville, the combined funding was used to restore and renovate the historic Winterville High School. A 2011 special-purpose local-option sales tax (SPLOST) allocation repaid the USDA loan. In May 2017, the Watson Brown Foundation Junior Board awarded $10,000 to the Winterville Heritage Foundation to help pay for the HVAC system for the Winterville Auditorium.